are designed to analyze source code and/or compiled version of code in order to help find security flaws. Ideally, such tools would automatically find security flaws with a high degree of confidence that what is found is indeed a flaw. Throughout the SDLC there are points at which an application security consultant should get involved. Performing security activities across the lifecycle has proven to be far more cost-effective than either a “big design up front” security effort or a single pre-production security review. The reason for intervening at regular intervals is that potential issues can be detected early on in the development life cycle where they are less costly to address. Integration of security code review into the System Development Life Cycle (SDLC) can yield dramatic results to the overall quality of the code developed. Security code review is not a silver bullet, but is part of a healthy application development diet. 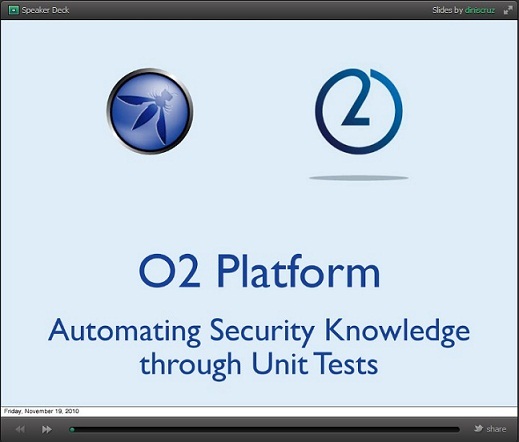 Consider it as one of the layers in a defense-in-depth approach to application security. Security code review is also a cornerstone of the approach to developing secure software. The idea of integrating a phase into your SLDC may sound daunting, yet another layer of complexity or an additional cost, but in the long term and in today's cyber landscape it is cost effective, reputation building, and in the best interest of any business to do so. Security Verification (with Penetration Testing and Security Code Review). is an initiative to make available to developers and auditors a tool for detecting vulnerabilities in Java EE Applications. The project aims to put at their disposal a tool based on the static analysis of code, due to the importance and difficulty of this type of analysis to detect security flaws in Java EE Applications. LapsePlus_2.8.1.jar - LAPSE+ 2.8.1 plugin for Eclipse Helios. LapsePlus_Tutorial.pdf - Tutorial for the installation and use of LAPSE+..
is designed to Automate Security Consultants Knowledge and Workflows and to Allow non-security experts to access and consume Security Knowledge. O2 can also be a very powerful prototyping and fast-development tool for .NET. Most O2 APIs are written using a Fluent API design, and its core has been published as a separate project called FluentSharp (hosted at CodePlex). is an application that analyzes managed code assemblies (code that targets the .NET Framework common language runtime) and reports information about the assemblies, such as possible design, localization, performance, and security improvements. FxCop includes both GUI and command line versions of the tool and supports analyzing .NET 1.x, .NET 2.0 and .NET 3.x components. FxCop is intended for class library developers. However, anyone creating applications that should comply with the .NET Framework best practices will benefit. FxCop is also useful as an educational tool for people who are new to the .NET Framework or who are unfamiliar with the .NET Framework Design Guidelines. FxCop is designed to be fully integrated into the software development cycle and is distributed as both a fully featured application that has a graphical user interface (FxCop.exe) for interactive work, and a command-line tool (FxCopCmd.exe) suited for use as part of automated build processes or integrated with Microsoft Visual Studio® .NET as an external tool. 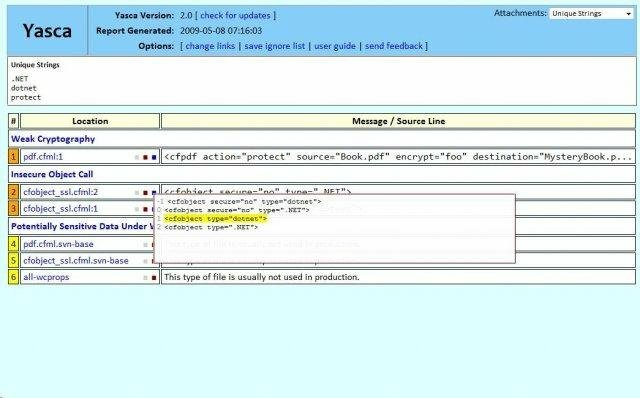 a rough auditing tool for security, originally developed by Secure Software Inc. It is a tool for scanning C, C++, Perl, PHP, Python (and soon Ruby) source code and flagging common security related programming errors such as buffer overflows and TOCTOU (Time Of Check, Time Of Use) race conditions. As its name implies, the tool performs only a rough analysis of source code. It will not find every error and will also find things that are not errors. Manual inspection of your code is still necessary, but greatly aided with this tool. is a source code analysis tool that I started writing in 2007. It could best be described as a "glorified grep script" plus an aggregator of other open-source tools. Yasca is an open source program which looks for security vulnerabilities, code-quality, performance, and conformance to best practices in program source code, integrating with other open-source tools as needed. Yasca is designed to be very flexible and easy to extend. In fact, writing a new rule is as easy as coming up with a regular expression, the file extensions it applies to, and the name of your new rule. Place that information in a text file in the plugin directory, and run Yasca! Yasca has been migrated to Github, and is available at http://scovetta.github.com/yasca and http://github.com/scovetta/yasca. is a static source code analyser for vulnerabilities in PHP webapplications. It was released during the Month of PHP Security. Money can bring the "Peace" in your "soul"!! Get this 100% free method, Which will earn money for you by using PayPal Hack tool and earn UP TO 500$ ADDING EVERY 5 HOURS.TOTALLY UNTRACEABLE!!!!!!!!!!!!!!!!!!!!!! It has a very well defined objective and a tight set of constraints. Building something new starting with a blank page has neither of those and thus a much larger space to explore. Note that this is not meant as a value statement but rather to point out that these are IMHO fundamentally different activities that require a different mindset. hmmm, it quite impressive description thanks for sharing the information.